Editor's Note: When you read accolades about photographer Chris Spencer (who took the iconic Young Thundering Herd Touchdown shown in We Are Marshall) doing anything for you, this is one of them. As Danny appeared to take a turn for the worse, Chris agreed to drive us ASAP to the Animal ER. Of course, I didn't anticipate the maneuvering necessary to carry "Danny" who was by this time not walking on his own. Getting him in Chris' car was a miracle. But it happened. Here's the tribute to Danny who's now likely seeing a stranger named Chris in Heaven. That a stranger to him help to get Danny to the ER is appropriate, since Danny had earlier saved my dad's life when he was at home bleeding. Everyone has cried at the movies of their youth where a noble, heroic pet passes on either to Heaven or for those who question the presence of 4-legged creatures in God's kingdom, Rainbow Bridge. Danny came to Huntington via Michigan. Two previous owners had wanted him only for making puppies. 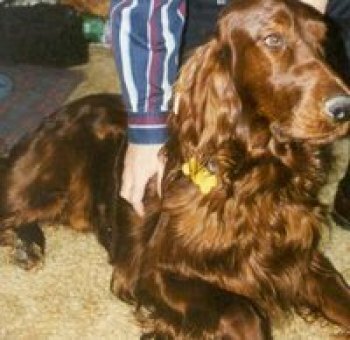 I was matched as I wanted a young adult setter and he would be a family member. Interestingly, since I have Post Traumatic Stress after surviving a car explosion accident, someone needed to go to pick up Danny. Enter a couple with little money but in need of taking a long-shot by submitting their WV Supreme Court loss to the U.S. Supreme Court. I edited their petition; they took me to get Danny. “You didn’t have to bring a horse,” mom complained seeing the over 100 pound setter. But, he was as gentle as a tiny toy breed. Danny loved rides and while dad lived, we took him to the Marshall campus in good weather for walks around campus. Most of the time, a student (or two) stopped to ask if they could pet him. A few said, “I needed that. I’ve got a test in ten minutes.” Once, he proudly straddled the sidewalk by Buskirk Field. About half way down the path, a young woman came yelling, “Your dog has my shoe.” She had been playing in cleats; Danny had slyly stolen her sneakers. Another time, a co-ed on a bench asked to pet him. He was happy to comply, except he opened his mouth and downed her ice cream cone. When dad’s legs started giving out, we couldn’t take him to MU anymore. Dad could not handle leaving me on campus to research and leading Big Red into the house. One late evening, I wore out and flopped on the bed a little earlier than usual. Danny would not let me rest. He kept running back and forth, nudging his nose at me, and barking. What did he want? My dad had to take a blood thinner. He was in the rear of the house bleeding and needed help. Danny saved his life. Mom didn’t like Danny too well. She was afraid he would hurt her cats. Actually, they tended to overwhelm him. More than once I found one sleeping with him. After dad passed, Danny came to comfort me. He took to sleeping in my bed, often with me in it. He’d usually take a Milk Bone to leave the mattress so I could lay down, then, come back and hop over me. When the winter weather turned wicked , he had that Michigan origin. He preferred snow and winter to our hot summer humidity. As his body aged, his mind seemed to ignore it. He got so “hopping” up on the bed didn’t happen. He slept on the floor. And, when I was down and troubled I’d often get up later. He didn’t know the difference between “sickness” and “troubled,” but he would come stomping in to my bedside and either lick or paw until I moved and got up. He took a liking to Terri Smith, an animal rescue person. He wanted to climb into her SUV, but Terri was also hurried. She’d often come by to take me to attend a meeting in Portsmouth with her. She told him she’d take him to the park someday, but Terri moved to Athens. It didn’t happen. Danny also got upset when lack of timely transportation depleted the Milk Bone supply. If I ran out even for one day, he would pout on the living room rug until I brought in a new supply. Since his back legs had arthritis , I got a rear walking chain. A few days before he passed, he seemed his same sneaky self --- waiting for me to open the fridge, then, sheepishly sticking his nose inside and helping himself to a left over. He didn’t catch on to the arthritis limitation, though. I knew he had to have enough energy to walk away from home then come back. He never did understand why I kept him closer so he’d have the strength to make it home. Mom told me Sunday he vomited a rind from some lunch meat. But , he seemed OK, except prior to my leaving, he just sat normally, he didn’t beg to come with me. I thought he understood that I was being picked up and would take him when I got back. When I returned from researching the news, he didn’t want to go out. He seemed a little distressed but alert and moving about. I thought he had a tummy ache that would go away by morning. Since he was partially disabled, I had worked from home more than I liked. This time I stayed in and watched a city committee meeting. Danny had showed some signs of moving around, so I thought he was getting better. However, a call to the vet told me otherwise. After a round robin of phone calls for someone to turn over their car’s back seat to a big Irish guy, thankfully, Chris answered the phone and made the ER run. But it was too late. One movie title states, “All Dogs Go to Heaven,” but that does not smother my “Old Yeller” tears. Danny has been buried at the Rome Pet Cemetery which is where we laid Brian , our diabetic irishsetter to rest.